David Oppenheim (1664–1736), chief rabbi of Prague in the early eighteenth century, built an unparalleled collection of Jewish books and manuscripts, all of which are housed in the Bodleian Library at Oxford and still used by scholars today. The collection testifies to the networks of power, prestige, and opportunity that extended across Europe and the Mediterranean basin, to the myriad connections Jews maintained with each other across political borders, and to the contacts between Christians and Jews that books facilitated. It contains works of law and literature alongside prayer and poetry, and it functioned as a unique source of personal authority and fame for Oppenheim. The story of his life and library brings together culture, commerce, and politics, all filtered through this extraordinary collection. Based on careful archival reconstruction, Joshua Teplitsky’s book offers a window into the social life of Jewish books in early modern Europe. Jean-Paul Sartre was one of the most influential thinkers of the twentieth century. Regarded as the father of existentialist philosophy, he was also a political critic, moralist, playwright, novelist, and author of biographies and short stories. Thomas R. Flynn provides an account of Sartre as a philosopher of the imaginary, mapping the intellectual development of his ideas throughout his life, and building a narrative that is not only philosophical but also attentive to the political and literary dimensions of his work. Exploring Sartre's existentialism, politics, ethics, and ontology, this book illuminates the defining ideas of Sartre's oeuvre: the literary and the philosophical, the imaginary and the conceptual, his descriptive phenomenology and his phenomenological concept of intentionality, and his conjunction of ethics and politics with an 'egoless' consciousness. It will appeal to all who are interested in Sartre's philosophy and its relation to his life. Life imprisonment has replaced capital punishment as the most common sentence imposed for heinous crimes worldwide. As a consequence, it has become the leading issue in international criminal justice reform. In the first global survey of prisoners serving life terms, Dirk van Zyl Smit and Catherine Appleton argue for a human rights-based reappraisal of this punishment. As jurisdictions both abolish death sentences and impose life sentences more freely for crimes that would never have attracted capital punishment, the number of people facing life sentences continues to expand. The authors explore this trend through systematic data collection and legal analysis. Ultimately they contend that life imprisonment, in many of the ways it is implemented worldwide, infringes on the requirements of justice. Life Imprisonment is an incomparable resource for lawyers, lawmakers, criminologists, policy scholars, and penal-reform advocates concerned with balancing justice and public safety. A series of disruptive, unnerving sounds haunts the fictional writings of Franz Kafka. These include the painful squeak in Gregor Samsa's voice, the indeterminate whistling of Josefine the singer, the relentless noise in "The Burrow," and telephonic disturbances in The Castle. In Kafka and Noise, Kata Gellen applies concepts and vocabulary from film theory to Kafka's works in order to account for these unsettling sounds and explore the complex role they play in Kafka's larger project. At the same time, she offers a method for pursuing intermedial research in the humanities, via the productive "misapplication" of theoretical tools, which exposes the contours, conditions, and expressive possibilities of the media in question. This book will be of interest to scholars of modernism, literature, cinema, and sound, as well as to anyone wishing to explore how artistic and technological media shape our experience of the world and the possibilities for representing it. Andrey Tarkovsky only made seven films, but all are celebrated for their striking visual images, quietly patient dramatic structures, and visionary symbolism. Time within Time is both a diary and a notebook, maintained by Tarkovsky from 1970 until his death. Intense and intimate, it offers reflections on Dostoyevsky, Tolstoy, Hermann Hesse, Thomas Mann, and others. He writes movingly of his family, especially his father, Arseniy Tarkovsky, whose poems appear in his films. He records haunting dreams in detail and speaks of the state of society and the future of art, noting significant world events and purely personal dramas along with fascinating accounts of his own filmmaking. Rounding out this volume are Tarkovsky's plans and notes for his stage version of Hamlet; a detailed proposal for a film adaptation of Dostoyevsky's The Idiot; and a glimpse of the more public Tarkovsky answering questions put to him by interviewers. Published twenty years ago, Leela Gandhi's Postcolonial Theory was a landmark description of the field of postcolonial studies in theoretical terms that set its intellectual context alongside poststructuralism, postmodernism, Marxism, and feminism. Gandhi explained pertinent concepts and schools of thought, examined the contributions of major thinkers, and pointed to postcolonialism's relationship with earlier anticolonial thinkers. The revised edition of this classic work reaffirms its status as a useful starting point for readers new to the field and as a provocative account that opens up possibilities for debate. It includes substantial additions: A new preface and epilogue reposition postcolonial studies within evolving intellectual contexts and take stock of important critical developments. Gandhi describes what is enduring in postcolonial thinking - as a critical perspective within the academy and as an attitude to the world that extends beyond the discipline of postcolonial studies. The Black City is a portrait of New York City written by German postwar author Hubert Fichte between 1978 and 1980. Fichte researched the city as the center of the African diaspora, conducting interviews and composing essays about syncretism in culture and the arts, material living conditions in the city, and political and individual struggles based on race, class, and sexuality. Often compared to the work of Jean Genet and Kathy Acker, Fichte’s novels and nonfiction are exuberant and erudite, contesting the stylistic and ethnographic norms of the time to locate a “utopic potential” for poetic and political revolution in the cultural heritage and contemporary life of the African diaspora. 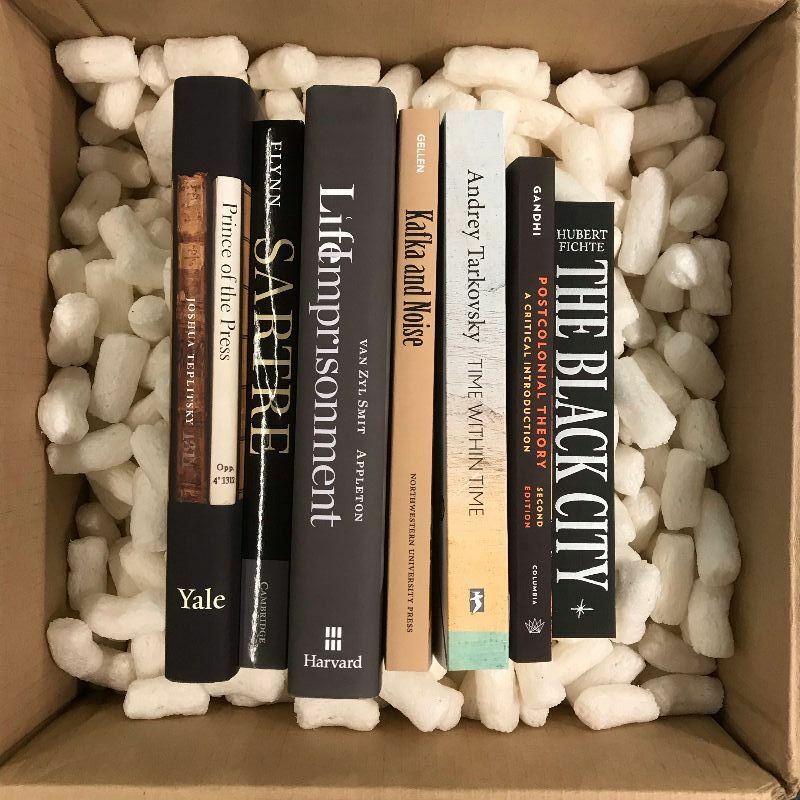 Translated into English for the first time, The Black City provocatively exposes the complexities of its author’s subjectivity, while raising questions about how notions of exploitation, authority, and authenticity manifest themselves in pseudo-ethnographic practices. "Tarkovsky for me is the greatest," wrote Ingmar Bergman. Andrey Tarkovsky only made seven films, but all are celebrated for its striking visual images, quietly patient dramatic structures, and visionary symbolism.